Last year I made some Snowman ornaments that had hats and they were such a big hit that this year I thought I'd try my hand at some reindeer ornaments! I started working on this file before my carpal tunnel surgery (that will be another post) and I have just been able to finish it up in the last few days because of limited use of my left hand. 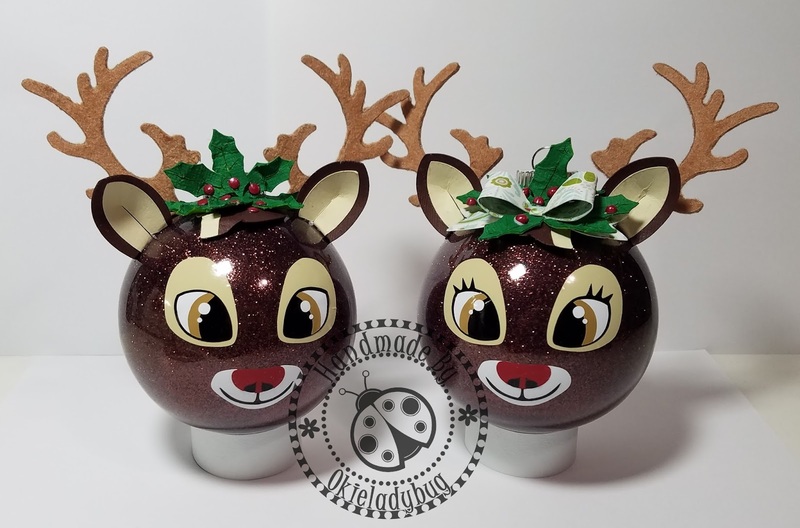 I am really loving these cute reindeer and I think they will be a great addition to a Christmas tree. I used Make the Cut to design the elements and then exported the file as an SVG so I could upload it into Cricut Design Space for cutting. One thing that irritates me about Design Space is that when I import an SVG I always have to make sure the file size is correct because it always imports larger than what the design is suppose to be. My work around that is to always include a base layer, 12x12 in this instance, so I can easily resize to the correct proportions. On some other sets I made I used the Martha Stewart Branch punch and placed them where the holly is in the picture. I also used some red ribbon instead of cutting a paper ribbon. I think I might add some "snow" to the antlers and ears for the next set I make. My carpal tunnel surgery on my right hand is going to be the first week in January and when I have that one done I will have to take off work because I will be a lot more limited to what I can do so I am hoping the sales on this file will help me get some bills paid in advance so I won't be stressing out about having the next surgery done. IMPORTANT PURCHASE AND DOWNLOAD INFORMATION, PLEASE FOLLOW THE DIRECTIONS (I have had people turn me into Paypal because they said they didn't receive the file but they did NOT follow the directions below). Purchase and Download instructions: Once you hit the "BUY NOW" it will take you to Paypal where you can pay for the item. Once purchase is complete Paypal will redirect you to "Return to Merchant" where you will given the link to download the files from Google Drive. You will need to know where files are saved on your computer in order to open the files. I do not have that information as I don't know how your computer is set up. 1 zip file is included in this purchase. 1 PDF files - Instructions for supplies needed, cuts that are in the file and assembling the reindeer ornaments. 1 SVG files - Includes all pieces needed to complete a male and female reindeer ornament. If you missed out on the Snowman Ornament with Gingerbread Bonus last year I am offering a special of the Snowman Ornament with Gingerbread Bonus AND the Reindeer Ornament. 1 zip file included in this purchase. 3 SVG files - 1 file of Snowman faces, along with the Gingerbread faces bonus. 1 file for Snowman Hats. 1 file for Reindeer faces and elements. Thank you for sharing your work. These are darling. Avaleigh and Jude will love these!! Okie, I will buy the full set at the beginning of the month. I love these. Will I be able to make the snowman face bigger? Yes, I did read it...lol but was already typing 🙂. I seen a file where you use two fish bowl with the glitter and make a snowman. She had a really cute face on him. Hope you feel much better when you get your other hand done. I go back to the doctor on Thursday hoping my cancer hasn’t come back. But after what my Son is going through I am just a wee bit afraid. Hoping that the mass is something else, no need for my Son to have to much on his plate. 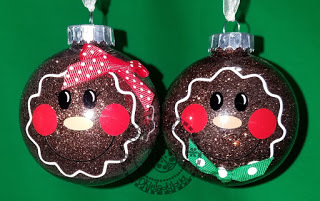 Thanks for sharing Oakie these are absolutely adorable. I love the reindeer so much!!! My hands are letting me do a kit these days. I have to have a battle plan to craft if I want to use the hands for the next two days. Hope it goes really well. I really love your Rudolph and was on the verge of buying your product until I read that I could not create to sell it. That was disappointing to me but I also realized that on your female deer you have horns. So just saying. female deer aka doe. DO NOT HAVE HORNS. So I took the extra time and created Rudolph myself. Just wanted to let you know female deer/doe...do not have horns. Best of all to you! You're arrogance and ignorance is refreshing. Don't care if you buy my files or not or make your own. Female reindeer DO have horns. Thank you for offering this. This is awesome!